les petits gars du globex font fort ..
à cette heureci, tokyo n'est pas encore ouvert , donc pas de cotation nikkei ..
je ne peux pas en dire plus sur le moment ..
et c'était sur l'or ET l'argent , pas seulement sur l'argent ..
surtout pour faire craquer les spéculateurs en levier sur le comex ..Jojo ..
le physique, il est pas chez les mains faibles .. et ils ne peuvent rien faire .. mais tu fais bien de mettre les points sur les i, pour les quelques pigeons qui se feraient piéger ..
au contraire, profitez des soldes du cartel, ça va pas durer ! je parie que demain, kitco va nous annoncer craquage bulle spéculative argent .. et prise de bénéfice des spéculateurs .. comme si à cette heure ci .. c'était possible ..
ils sont de plus en plus désespérés, à mener des raids aussi grossiers ..
ci dessous graphs or et argent, FIXES..
de manière à ce que ça reste figé historiquement ..
renseignement américains surveillaient depuis le mois d'août dernier. le physique, il n'est pas chez les mains faibles .. et ils ne peuvent rien faire .. mais tu fais bien de mettre les points sur les i, pour les quelques pigeons qui se feraient piéger ..
ils en détiennent 45%, alors que de l'autre coté ce n'est que du papier et dans le sol. elle est à ce jour de 25 200 tonnes. l'argent produit se perd dans la nature. oui, il faut garder toutes positions en physique et ne pas écouter l'intox des médias à ce sujet. mais les informations de Hardeur's de Hardin sont LA pour faire la part des choses et d'informer le public sur les manipulations du cartel. LOL Sandro, j'y crois pas ! ils nous ressortent et pour la nème fois, le décès de Ben Laden ! et cette fois ci, pas de mort naturelle ..
ils osent tout ces gens là ..
le point De Norcini, qui insistait sur le danger potentiel du dernier relévement des appels de couverture .. Here is the scenario - as long as price moves higher, the margin hike will not affect the small specs because their long positions will be in the money and it will not become an issue. 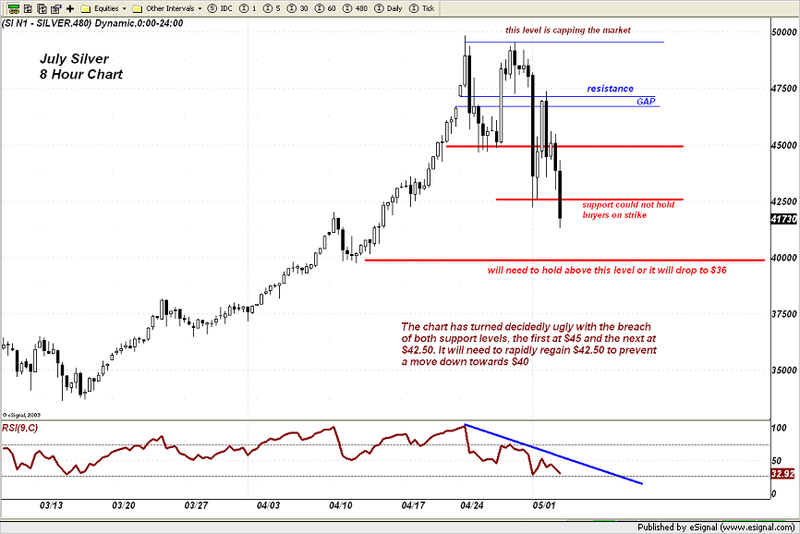 When it does become an issue however is when prices fall and trigger stop loss selling which cascades. Then paper drawdowns or losses mount quickly and margin calls go out to the smaller specs who go underwater. Next week will be key to where we go next as far as whether we get a new leg higher through $50 or we set back to first test support down near $45 provided the gap region between $47.15 - $46.70 fails to hold on the test lower. l'argent continue à remonter sur ses plus bas ..46.64 $,au moment où je poste ..
les minières qui avaient ouvert en forte baisse, se resaissisent également .. c'est encore trop tôt pour dire si cette correction débute, ou a déjà fait long feu .. There is nothing from a fundamental perspective to cause a fall this large. Silver has been the most rapidly appreciating of the metals in the past months and if there was one that looked a bit frothy it was silver," said Ben Westmore, commodities economist at National Australia Bank. "This is mostly technical. We expect silver to be in relatively close step with gold and while both have risen strongly, silver may have moved a bit too far ahead." But in spite of the falls, traders said it was too soon to close the book on silver's astounding 170 percent rally over the past 12 months. "Although that was a brutal wash out of some length, silver is now back into the original bullish trend channel, so while $41 holds, the trend is still intact," one trader said. excellentimes commentaires de Dan, the Goldentruth, qui reléve en plus des points abordés ici .. que certains des plus importants brokers de la place ont répercuté l'augmentation des appels de couverture argent, avec une hausse encore plus importante que celle du CME! si c'est pas du crime organisé, ça .. ! Third, some big off-Comex futures brokers raised their in-house margin requirements for silver to double or more than double the required margin at the Comex. The most prominent firm, and one of the world's largest commodity brokers, is MF Global. MF Global jacked its margins on Friday to a little over $25k. MF Global happens to be run by ex-Goldman CEO Jon Corzine. Hmmm, anyone think there is any connection between Corzine and the big firms who control the Comex? How about between Corzine and the CFTC chairman who is also an ex-Goldmanite? Another very large futures broker, thinkorswim - which happens to be owned by Ameritrade - raised its margin on silver to over $30k. Anyone besides me understand that Ameritrade caters to small, individual speculators who were likely forced to sell to cover this margin hike? Second, the CME has been raising silver margins regularly now. We are not seeing this in other commodity contracts. In fact, the margin on Comex silver was raised over the weekend from a little over $12k to a little over $14k. That's over 30%. The margins on gold were not raised. The CME always seems to raise silver margins when silver is moving sharply higher and when all of the evidence points to physical silver shortages. That latter point was apparent to me when I saw the very low number of delivery notices handed out. Typically a large percentage of the open contracts are given notice and delivered within the first few days of a delivery period. Not this time. What this tells me is that banks with large counterparty delivery positions (i.e the ones with big short positions, like JPM and HSBC) are going to make an aggressive attempt to induce weaker hands to puke their positions before JPM and HSBC are actually required by contract law to make delivery. Let's see how this plays out over the next 3 weeks. Last notice day is May 27th and you can monitor delivery activity on the CME website. le dernier § sur Ted Butler est virulent.. mais compréhensible .. j'ai moi aussi du mal à comprendre pourquoi Ted s'entéte à "défendre" SLV..
ça montre au moins une chose ... c'est que les positions des silverbugs sont loin d'étre uniformes ... et que les divergences d'opinions peuvent librement s'exprimer au sein de cette "communauté"
China/Vietnam, largest and fifth largest gold buyers closed last night for holidays. more weight that last night was a strategic ambush. Ca devient du grand n'importe quoi. Ce qui m'inquiete serieusement est que Shanghai a releve Les appels de marges egalement. Ils n'ont pas fait ca sans raisons. Grosses short positions chinoises via JPM ou un autre vecteur a purger ? Le cartel ne se laissera pas faire et ses moyens sont Quasi-illimites, Fed oblige. Alors ca va vraiment secouer. Ca fait un moment qu'on le repete, mais la... C'est maintenant, et les indices de volatilite vont s'affoler dans les prochaines Semaines, pas possible autrement. oui, Pascal ..ils ont attaqué à nouveau, et comme souvent, après la fermeture de londres qui a cloturé sur les plus hauts de la séance .. depuis le raid commencé très tôt, en clobex, cette nuit ..
gros revirement après la cloture londres, comme je le disais plus haut .. y compris pour les minières qui cloturent au plus bas et "red à souhait"
02 May 2011, 04:35 p.m.
(Kitco News) -CME Group is hiking silver margins by another 11.6% after already hiking them twice last week, the exchange announced Monday afternoon. The “initial” margin to open new speculative positions in the main 5,000-ounce silver-futures contract will rise to $16,200 from $14,513, according to a notice released by the exchange. The “maintenance” margin for exiting speculative positions, as well as both initial and maintenance margins for hedger positions, will rise to $12,000 from $10,750. The changes will be effective after the close of business on Tuesday. Margins are also rising for Comex MiNY silver futures and E-mini silver futures. et le plus important ..
Interestingly, the Jul 11/Dec 14 backwardation has widened this morning to around 90 cents. Prior to the Sunday night smack down, it had been running around 60 cents for the past week or so. From this perspective, the JPM hit was counterproductive. The backwardation in silver started on Feb. 3, 2011 when the price of silver was just under $29/oz. On Feb. 11, Reuters called the backwardation "unprecedented". The gap between the front month futures contract and the Dec. 15 contract widened to 73 cents on Feb. 18, 2011. On March 7, the gap widened to 109 cents. The gap then started to narrow as the price increased as you would expect. The gap then bottomed at 40 cents on April 13, 2011. 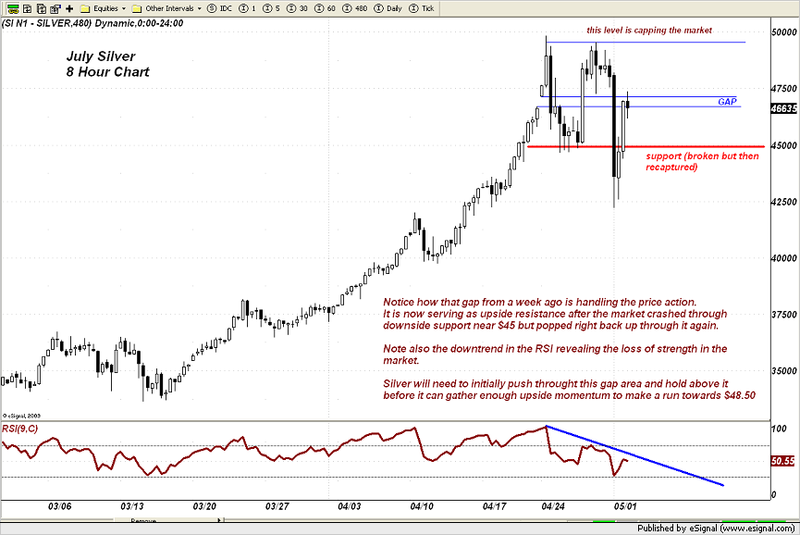 The unexpected then occurred when the gap started widening even as the silver price rose. On April 28, the gap had widened to 76 cents. On April 29, 2011, the gap has now widened to 89 cents. 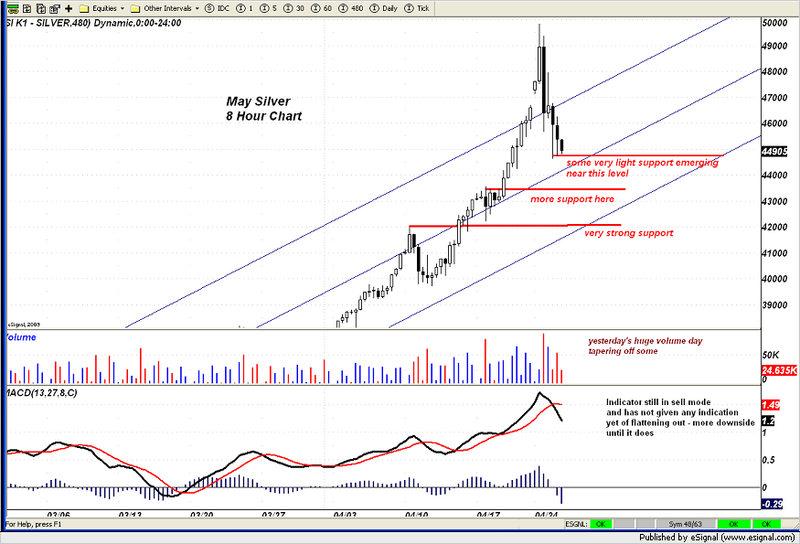 As far as I am concerned, we have a whole new ballgame in the silver market. Below are the final settlement silver futures as of Friday 4/29/11. As you can see from the futures pricing above, the gap between the front month futures contract and the Dec 15 contract has widened to 89 cents. The gap has significantly widened from 40 cents on April 13, 2011. The western mainstream media does not seem to want to touch the silver backwardation with a stick. Reuters had a Feb. 11, 2011 article describing the backwardation as unprecedented. To Barron's credit, Randall Forsyth did mention the silver backwardation in the 5/2/11 Up And Down Wall Street Column. Other than these two articles, there has been radio silence concerning the unprecedented backwardation in silver. In this latest Barron's article, Silver Speculators Look Out! by Murray Coleman, they talk about selecting other commodities based on attractive signs of backwardation and based on momentum. That is exactly what we have for silver. Some how, silver is suppose to be a sell and these other commodities are a buy. Ridiculous. The silver bears can hit the mining shares, put out a barrage of negative headlines, put out a barrage of false information; but the backwardation in silver has intensified - big time. Even at these prices, the market is saying that silver demand exceeds supply and that the path of least resistance is up over the next few weeks. Backwardation has widened again after today's smack-down to 97 cents. JPM is in deep trouble. observations faites entre le 26 et le 28 avril dernier.. donc avant même le raid de ce matin ... et déjà totalement anormales .. I would like to bring to your attention the absolutely unprecedented silver trading in the history of the Comex. I have pasted below section from my updates to subscribers that discusses the issues of volume to open interest ratios which are simply inexplicable from ANY perspective of normal futures trading and have never occurred before on this scale. It was only at the end 2010 that for the first time ever in the history of the Comex did trading volume exceed total Open Interest. History was made again yesterday as the total volume traded reached 286,268 contracts on an Open Interest of 152,945! This is also the highest ratio in history. This is equivalent to every single contract being sold 1.9 times on the day. Clearly a lot less contracts were involved so contracts changed hands several times. This is High Frequency Trading; the cartel are buying and selling between themselves and with their algorithms the average trader cannot get in front of them and so the market price is being set by an entirely manufactured order flow designed not to let any long contracts get picked up outside of the trading ring. Even more stunning is the trading in the MAY contract month; first notice day is on Friday when these contracts must be either fully paid for, rolled or sold: the trading volume was 181,239 while the open interest was 41,008; you have got to be kidding me! This is equivalent of all the contracts being bought and sold 4.4 times in the session. More likely it was perhaps only 30% of the open interest involved which would mean those contracts changed hands 15 times in the day…that is just not possible for a contract month only three days from first notice; this is the smoking gun of the cartel manipulation. 311,519 contracts. This is equivalent to every contract changing hands 2.2 times in the day. In the MAY contract itself it was even more ridiculous…the open interest was 26,890 and the traded volume was 170,142! In other words, equivalent to each contract changing hands 6.3 times in the session. This is simply unthinkable in a contract that hits First Notice three days later. This is High Frequency Trading on steroids! The outrageous trading volumes continue to be seen in silver. In the MAY contract the volume reached 40,243 on an open interest of 10,960 contracts. Once again the TOTAL volume traded exceeded TOTAL open interest by a ratio of 1.65 (total vol= 233K and total OI=135k). nous ne sommes pas du tout dans le scénario des frères Hunt, où cette stratégie avait désamorcé la "spéculation"..il s'agit ici de tout autre chose ..
And there are no Hunt brothers for the exchange officials to lean on to break the bulls. The buying is dispersed and world wide. They can raise the Comex margins to 100% and it will not affect the buying of bullion. But it may open up a yawning chasm between the paper markets and the physical markets that will be harder and harder to ignore. And that is unfortunate for those who seek to be the masters of the world, at least on paper. peut 'on attrapper un léviathan avec un hameçon, ou au lasso? Tens of thousands of buyers, both big and small, taking on the banking giants, draining them of silver, bouncing back again and again, and finally leaving them exposed, high and dry, and nakedly short, for all to see. The many, seeking to string the bankers on a rope of silver, and bring them down. en contrepoint, une analyse technique CT baissiére de Hinde capital.. qui anticipe une chute de pas moins de 15$ en 3 à 5 séances ! voir les graphes de déviation standart par rapport aux moyennes mobiles de long terme.. et la saisonnalité qui rentre dans une période défavorable ..
le pb, Pascal c'est que la backawardation es tjs présente ..
mais comme les marchés de futures chinois sont encore fermés pour un tres long week end ( jusquà demain mercredi, si j'ai tout bien compris ) .. le cartel en profite ..
que va t'il se passer quand la chine va réouvrir, jeudi? cette fois ci c'est Peter de Graff qui s'y colle .. et pour lui, il n'est pas question de 36 $ silver ..
à 42.50 $ il passe à l'achat sur l'argent et le titre de son article est suffisamment éloquent ..
quand à Turk, il note la formation d'un drapeau bullish sur l'argent ..